TIHAI is currently accepting applications for student research assistants for our ongoing research study assessing the effects of animal-assisted interventions on social anxiety disorder. Student research assistants will participate in data collection and data entry. Applicants must be undergraduate or graduate students at Tufts University and have the ability to travel to the Grafton campus. Applicants with experience conducting human subjects research, current CITI training, and coursework in related fields (e.g., psychology, child development) are preferred. To apply, please email a cover letter and resume to hai@tufts.edu. Applications will be accepted on a rolling basis. TIHAI is pleased to be accepting applications for our 2019 summer internship. This position will provide the opportunity for an undergraduate student learn valuable research skills within the field of human-animal interaction, with the goal of promoting the health, strengths, and well-being of humans and animals. They will gain hands on experience grant writing, designing and executing research, learning how non-profit programs become sustainable, and how HAI programs work within community settings. Responsibilities will include a large percentage of hands on research experience in an ongoing HAI research project (see below), as well training in conducting literature reviews and grant writing, shadowing and observing our Paws for People therapy dog program training, evaluating therapy animal teams, and observing therapy animal visits under guidance of our therapy animal program coordinator. This summer’s current research project includes a joint child and dog physical activity program. Responsibilities for the intern will include assisting in preparation of protocols, ethical reviews, and recruitment strategies. A requirement of the program is completion of CITI training in which interns will have online coursework to educate them in ethical principles of research. Applicant requirements include high school diploma and current enrollment in a university program (or college degree), ability to work independently, computer skills, writing skills, motivated, and an interest in learning about human-animal interaction non-profit programs. Prior experience conducting research is preferred. The internship is unpaid, though flexible in scheduling. Our intern can expect to work a minimum of 20 hours per week, which are typically Monday through Friday 8am-5pm, though many therapy animal visits and training are on weekday evenings and Saturdays and Sundays. The internship is based out of the Cummings Veterinary School in North Grafton, MA and the intern will be responsible for transportation to Cummings School or local facilities where our therapy animals visit (hospitals, nursing homes in the Central Massachusetts area, etc.). The internship will begin June 2019 and go through August 2019 (start and end dates flexible). To apply, please send a copy of your resume/CV, a cover letter indicating your interest in the position and your career goals, and a letter of reference to hai@tufts.edu. Applications will be reviewed on May 10th, 2019 and will continue to be accepted on a rolling basis until the position is filled. 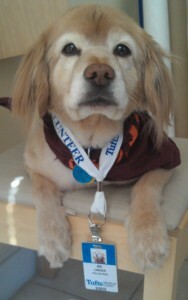 If you are interested in volunteering with Tufts Paws for People, please visit the Ways to Volunteer page. If you are a Tufts student interested in outreach or service learning opportunities, please contact the Cummings-Tisch Civic Life Coordinator, Erin King at erin.king@tufts.edu.